Create your file from your home or office and upload to your store of choice for pick up. Upload available 24 hours. 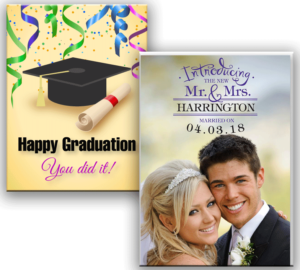 At Mail N Copy, we offer PERSONALIZED ANNOUNCEMENTS, CARDS, CALENDARS AND MORE that can be customized with your photos and/or special sayings. Come in today to view our great selection of ANNOUNCEMENTS, INVITATIONS AND CARDS and choose your favorite. Don’t forget to bring in your perfect photo, to make your cards and calendars one of a kind.